“Tishrei in Lubavitch” walks the reader through a Tishrei with the Rebbe through over 200 masterfully curated photos, accompanied by insightful captions and commentaries. 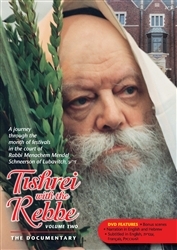 Whether one is able to “relive their memories,” or enjoy a first taste of the special meaning with which the Rebbe imbued the holidays, “Tishrei in Lubavitch” enables one to experience the solemn, the joyous, the uplifting and the unforgettable moment of the month of festivals in the Rebbe’s presence. Tishrei Conversation Points for Parents and Teachers are available here. Words have the power to inspire the imagination, but an image can bring something to life. Those who merited to experience the holidays of Rosh Hashanah, Yom Kippur, Sukkot and Simchat Torah with the Rebbe – chasidim, and those from across the Jewish spectrum; young and old – found themselves invigorated and renewed. In similar vein, the album’s captions, narratives and quotes from the Rebbe and the Tishrei prayers, are designed to engage and inform – as well as to inspire and uplift, individuals from across the Jewish community. Selected from the best photos of Levi Y. Freidin, Yossi Melamed and other photographers between the years 5740 and 5745 (1979-1984). Our Price: $24.95 plus shipping.